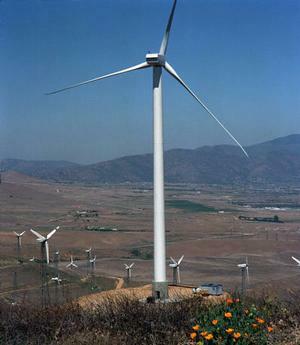 SACRAMENTO, California, December 18, 2009 (ENS) – California energy regulators have approved Southern California Edison’s request to construct a 173 mile long electricity transmission line to bring wind power generated in the Tehachapi Wind Resource Area in Kern County to Los Angeles and San Bernardino counties. To increase access to new renewable energy, the California Public Utilities Commission, CPUC, Thursday approved construction of Segments 4-11 of the Tehachapi Renewable Transmission Project. “The thousands of megawatts of renewable energy capacity this transmission line will add to our grid will help California meet its ambitious Renewable Portfolio Standard, protect our environment, increase our energy security and further the growth of our green economy,” the governor said. In September, the governor signed an executive order directing the California Air Resources Board to adopt regulations increasing California’s Renewable Portfolio Standard from 20 percent by 2010 to 33 percent by 2020. The CPUC and California Energy Commission have endorsed this change and it is a key greenhouse gas reduction strategy in the California Air Resources Board’s Scoping Plan for Assembly Bill 32, the Global Warming Solutions Act. The transmission project approved Thursday is the main portion of the 11 segment Tehachapi Renewable Transmission Project. It will provide access for up to 4,500 MW of wind power from the Tehachapi Wind Resource Area in a mountainous part of the state to provide power to Los Angeles and San Bernardino. “The Tehachapi region is the largest wind resource zone in California and can support economic renewable resource development,” said Commissioner Dian Grueneich, the commissioner assigned to the Tehachapi Renewable Transmission Project proceeding. As lead state permitting agency for the Tehachapi project, the CPUC conducted an environmental impact report in compliance with the California Environmental Quality Act. After evaluating the environmental impacts of the proposed project and 11 alternatives, the final report identifies the project approved Thursday as the Environmentally Superior Alternative. This alternative covers 173 miles from the new Whirlwind substation in southern Kern County to the Mira Loma substation in Riverside County. About 70 percent of the approved project’s route is on existing right-of-way in compliance with the state policy, known under a state law as the Garamendi Principles, to site and expand transmission infrastructure within existing right of way. The CPUC set a maximum cost of $1.5 billion for the project, excluding allowance for funds used during construction, estimated at $261.82 million, for an estimated total project cost of $1.8 billion for the project. In 2007, the commission approved Segments 1-3 of the Tehachapi Renewable Transmission Project, which will deliver about 700 megawatts of the project’s total carrying capacity. Construction on these segments is nearly complete and is expected to be fully energized by the end of this year. This brings to 500 miles the total of new transmission approved by the California Public Utilities Commission, CPUC, for the state’s investor-owned utilities. Five major lines capable of carrying 9,000 megawatts of power have been approved in the past three years with an infrastructure investment of more than $4.5 billion. Also on Thursday, the California Public Utilities Commission today approved a competitive solicitation process by which Southern California Edison, SCE, will offer independent renewable energy project developers long-term contracts to install 250 megawatts of solar photovoltaic generation on commercial rooftops within the utility’s service area. The solicitation plan is part of a June 2009 Commission decision expanding a renewable energy generation plan proposed by SCE to install two square miles of advanced solar panels on large commercial rooftops. Regulators not only approved the proposed local utility owned and operated solar generation stations but asked SCE to invite independent power producers to add another 250 megawatts of solar generation to the project. The two programs would bring to 500 megawatts the total generating capacity of the project  the largest U.S. photovoltaic program ever undertaken. At peak operation, the combined output will meet the needs of 325,000 average Southern California homes. “We undertook this project believing it would help California meet its aggressive “million solar roofs” goal and at roughly half the cost of typical photovoltaic installations,” said SCE Senior Vice President of Power Procurement Stuart Hemphill. SCE currently plans to launch the solicitation during the first quarter of 2010. It will be open to all solar project developers. SCE will then review proposals and award long-term power contracts to winning bidders later in the year. The first two commercial rooftop installations in SCE’s part of this solar generation project are already providing power to Southern California’s Inland Empire. A 33,700-panel, two megawatt installation began powering the Fontana area during the fall of 2008. And a 16,200-panel, one megawatt installation serving Chino was connected to the grid in October.